Snowblind was the result of a collaboration with The Principals for the NEWINC Showcase at Red Bull Studios New York. Red Bull Studios New York hosted the NEW INC showcase that highlighted projects from the program’s inaugural year, including Snowblind, a collaboration between Studio Studio and The Principals. A second installation was later commissioned by Aurora, a public art event in Dallas. It’s astounding what you can make with established components. Fog machines aren’t exactly a new environmental modifier, but with the application of light and motion tracking, you get a transcendental experience. When you’re inside Snowblind, the walls float away, and you can feel the endlessness of the color surrounding you. In an age where everyone is fighting for “immersion”, we love that these simple tools can create a piece worth getting lost in. 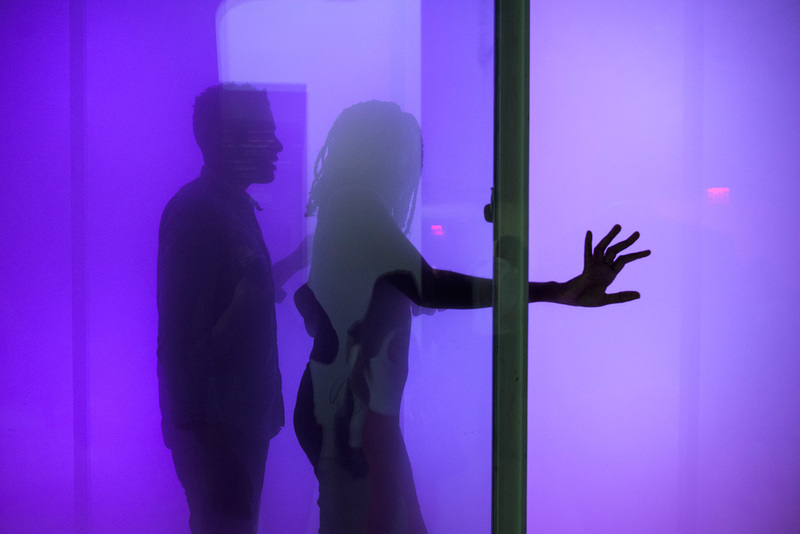 We used a fog machine to create the… well, fog, and then installed LEDs in the space to alter the color of the environment. Cameras detect a visitor’s presence that changed the color and mood of the experience.